SAN FRANCISCO—The State Public Works Board (SPWB) today approved preliminary plans for the renovation of the Old Solano Courthouse at 580 West Texas Street in Fairfield. Designed by E.C. 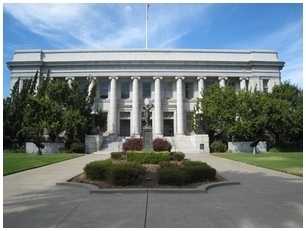 Hemmings in 1911, the courthouse, vacant since 2005, is considered an outstanding example of Beaux Arts architecture and appears in the Central Solano County Heritage Commission’s inventory of “Lasting Heritage” buildings. Solano County donated the property to the state for the project, which will help resolve a shortage of space for the Superior Court of Solano County. The renovated courthouse, at two stories and 29,900 square feet, will provide three additional courtrooms and associated support spaces for civil cases. The project includes seismic and accessibility upgrades, updating of all building systems, reconfiguration of nonhistoric parts of the building’s interior, and restoration of many of the building’s beautiful architectural features, such as the marble flooring and staircase, light fixtures, and decorative elements like the original clock in the main entry. The architectural firm of Hornberger + Worstell is designing the renovation consistent with standards of historic preservation, and the plans have been reviewed by the California Office of Historic Preservation. Approval by the SPWB marks completion of the preliminary plans phase and enables the project to move into working drawings. In the meantime, Plant Construction, selected in October 2011 as the project’s construction-manager-at-risk, will be performing outreach to provide local subcontractors and suppliers the opportunity to participate in prequalification and bidding. All qualified subcontractors, lower-tier subcontractors, and suppliers will be considered. The new courthouse is expected to generate hundreds of jobs, directly through construction and through indirect benefit to the local economy. Construction is scheduled to begin in mid-2013 and be completed in late 2014.